Should We Name the House? Many Cape Cod houses have names. Sometimes it is simply the owner's name. Other times it is whimsical such as a favorite from my youth, "Daddy's Mink." My mother and father named their second home, "Martingale." Mom's parents had a number of houses on their Camp Mayflower property that were all named. In the old days, houses had names not numbers. So, should we call this place "288" or maybe "Averisera?" We already have a blog going with one of those so maybe we'll keep it going with the house as the focus. Anyway, lots of work has been done here in the year plus since we moved in to rutted sandy lawn and walks with weeds and random shrubs growing up against the building. There is still a lot to be done. This record of a walk around the house shows where we are in August of 2015. Driveway needs a layer of stone to fill in some puddles (not visible today) and generally smooth things. The front lawn features a nice sitting area under the spreading maple tree. Not too much more required. I think a layer of sifted loam and some seed. The lawn in the foreground was made by us spreading loam over a dirt patch and seeding. We will extend the area this fall. The East side yard is still underdeveloped. It got loam and seed down last Fall which is OK. Being on a slope, the soil and seed wash away downhill. I wonder about fussing over the space. It all takes patience and I have decades to go at it. The back yard has been transformed in so many ways. The lattice work under the porch came down recently. That dried out the place and made the porch more comfortable. 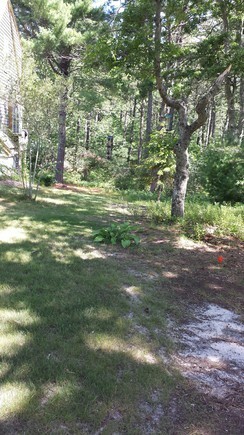 The former sand pit back yard has loam and seed for a nice lawn which will be extended this fall. The distant red shape is the wood chipper which is pretty cool. Looking up the West side yard at the stone patio and steps we did ourselves. Check out the vegetable garden boxes. Thanks Z! More on the Weest side yard gardens and flag stone walkway. Full circle, view of the front lawn and drive showing the flagstones se laid and the pallet of more stones to form into a walkway from the garage area to the front steps. The front lawn and house entrance. The 2x4 hand rails are unsightly as is the concrete front porch. More flagstone and concrete... I suppose. Did I mention snow? We bought a snow blower. A John Deere 826 from the late 1980s which is supposed to be a real work horse. 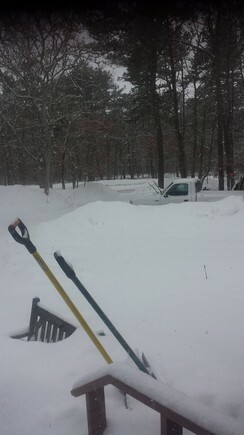 We have about 1500 square feet of drive, parking, and walkway to clear. Doing it by hand turned out to be a poor thing. Machine tools are good. Next up is a big gas tank to fuel it. The house is the voyage! Voyage on!